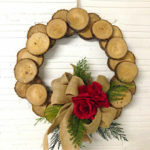 Wreaths are an essential part of the holiday and Christmas season. Hanging several tiny wreaths on a wall above your fireplace mantel or ornamenting your front door with a big one helps bringing the holiday spirit into your home. 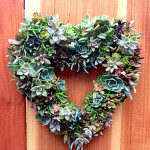 Crafting a fragrant holiday eucalyptus wreath is a nice way to enjoy the holiday season without being too fancy. They are sure to stand out no matter wherever you keep them and bringing them inside will let you enjoy the fragrant smell all winter long! 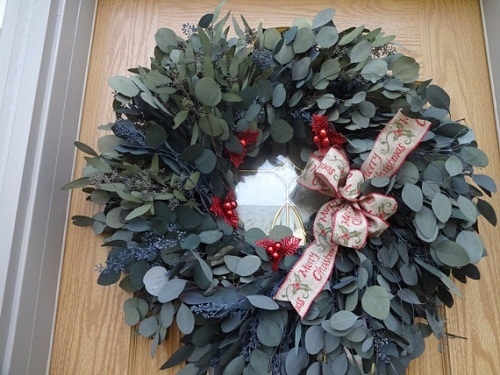 For a link to the Make a Eucalyptus Wreath video, click here. Hang the wreath wherever you want! Start with one variety of eucalyptus. For the base layer, work with two pieces at a time. Try to choose the sprigs with long stems so that you can insert the stems into the twig form. If this is not enough, use florist wire to secure them to the form. 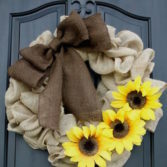 After finishing with the base layer, attach a different variety of eucalyptus to the wreath form. You can mix different types of eucalyptus to the same layer to suit your tastes. 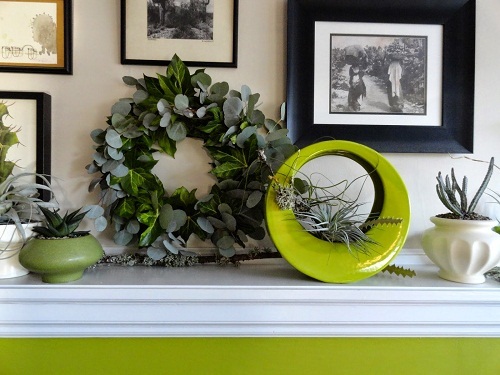 Repeat this process of adding eucalyptus sprigs to the same direction all the way around the wreath base. Make sure that the sprigs look even and uniform. If they are not, trim them to uniform lengths. After tucking the last eucalyptus sprig into the springs at the starting point, it is time for you to attach some adornments. Add small juniper sprigs, small bunches of pepperberry, and other adornments of your choice to the form with floral wire. These adornments have to be on top of all the other greens. 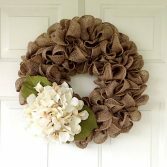 Create a hanger for the wreath by making a bow with the burlap ribbon (use a red ribbon instead if you are making the wreath for Christmas). Now, hang the wreath wherever you want. 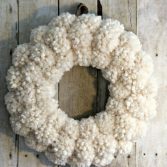 This pretty wreath will last for many weeks throughout the holiday season. 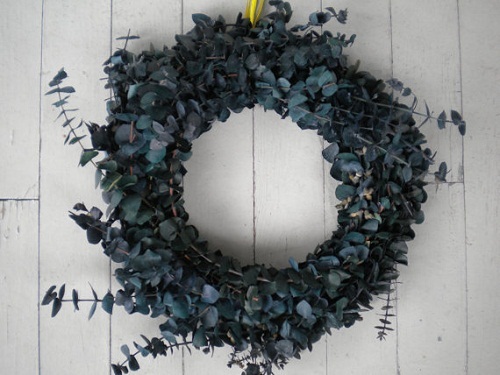 Make the environment fragrant and festive with a eucalyptus wreath. The eucalyptus will be available at your local florist. If you are going to use more than one varieties, don’t use more than one bunch (about 5 to 10 stems) of each type. You can use any kind of wreath forms such as artificial, Styrofoam, or traditional metal wire form. 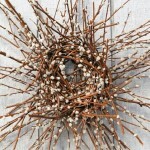 However, using a twig wreath form will require limited or no wire attachments. This holiday eucalyptus wreath is fragrant, festive, and makes a beautiful addition to any holiday décor! The red ribbon hanger, red pepperberries, juniper springs, and seeded eucalyptus add the perfect amount of color and texture to the wreath, making it a perfect holiday material! 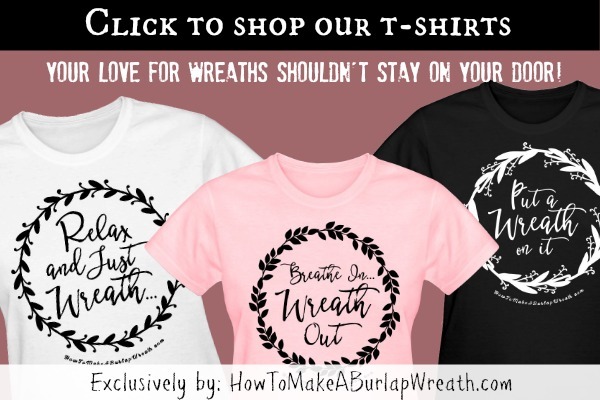 To decorate the wreath exclusively for Christmas, write Christmas words at the borders of a chalkboard wall message board and add a eucalyptus wreath to the center of it. 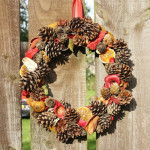 For more Christmas wreath ideas, click here. I love this! Thanks for including a video…I’m a visual learning so it’s going to help out a lot ;).